Is life insurance part of an estate and available to pay a deceased person's bills? It depends on whether the life insurance policy had a living, designated beneficiary at the time of the policy owner's death. A life insurance policy has one or more designated beneficiaries if the decedent completed a beneficiary designation form for the policy before his death. If at least one of the designated beneficiaries survives the decedent, the life insurance proceeds pass directly to the beneficiary outside of probate. This is a critical distinction because the probate process deals with the decedent's creditors and pays his debts with available estate funds. When the insurance proceeds go directly to a beneficiary, bypassing the estate, the money belongs to the beneficiary. Friends, relatives, and insurance beneficiaries are not responsible for paying any debts the decedent left behind, so the money is out of the reach of his creditors. The life insurance proceeds don't have to be used to pay the decedent's final bills. But there's a catch. People sometimes name their estates as beneficiaries of their insurance policies, possibly intending that the policy should do just that -- pay off their final bills. This sends the money directly into the estate's coffers. In this case, it can and would be used to pay his bills. The life insurance proceeds will pass directly to the decedent's living heirs-at-law, individuals so closely related to him that they would be legally entitled to inherit from him if he had not left a will. This can depend on state law and the insurance company's payment policies, but the bottom line is the same. The life insurance proceeds don't have to be used to pay the decedent's final bills unless they're payable to his estate rather than his heirs-at-law. The same rules apply if the decedent failed to complete a beneficiary designation form before his death. Either the insurance proceeds will pass into the decedent's probate estate and be available for paying the decedent's final bills, or the proceeds will pass directly to his heirs-at-law, safe from creditors. 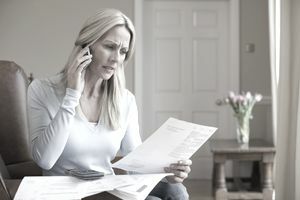 These rules address debts in the deceased's sole name at the time of his death, as well as personal tax debts, but they do not apply to estate taxes that may be due if the value of his estate is significant. A hefty life insurance policy payable to his estate might increase its value above the federal exemption amount so that an estate tax would be due. In this case, the proceeds are subject to taxation if the decedent personally owned the policy at the time of his death, or if he transferred ownership of the policy to someone else within three years of his death.